Behavior therapists have long used a technique to distract clients from their difficult thoughts. The client wears a rubber band around their wrist; when they have an upsetting thought, they snap the rubber band so that the sting wakes them up and interrupts the thought. This always seemed silly to me. And when I tried it myself, it didn’t work very well. The reasoning behind the rubber band is that distraction from a difficult thought will interrupt, not just the thought itself, but also the chain reaction that painful thoughts set in motion. We often go through the day thinking of what’s next. We plan dinner and dread the grocery store even as we’re walking around our home or office, long before we actually get to the store. Being 20 steps ahead of where we actually are misses opportunities that exist in the moment. But what if some of those moments aren’t very good? Wouldn’t avoiding them just make sense? The problem is that avoiding thoughts and feelings that evoke sadness or anxiety usually just postpones problems while they get bigger. There are endless ways to distract ourselves from even benign feelings such as boredom, or the effortful focus needed to complete a project. Constant phone checking may keep us from feeling bored or focusing on what we should be doing in the moment. I did 6 Google searches for ‘North Coast silver cuff raven steals the light’ –to find information about a bracelet I purchased at a thrift store over the weekend. Do I feel better for putting off writing this post? No I don’t feel better after my search, but I tell myself, “Ok, that wasn’t a great use of time, but now I am back to it.” I don’t need to chastise myself, but I don’t need to continue to distract myself either. Being able to experience our thoughts and feelings without judging them opens up the possibility for experiencing the richness of the moment. It may be as simple as feeling engaged with what we are doing, or acknowledging our humanness and bringing forgiveness to the moment. In practices like mindfulness-based cognitive therapy (MBCT) and mindfulness-based stress reduction (MBSR), therapists have people keep track of pleasant and unpleasant moments in their day. 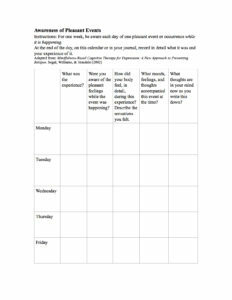 This doesn’t have to be a tiresome homework assignment; it’s just jotting down, at the end of each day, something you noticed that was pleasant, or the opposite. By doing so, you can more easily increase awareness of the experiences when they are happening. The most important component of mindfulness is attention to the moment. This awareness helps us notice what triggers ruminative thoughts. Rather than mechanically snapping a rubber band, we notice the thought and where our minds want to take it next. We don’t need to add to the thoughts, take them further, or elaborate on them. We also don’t need to classify or analyze them. Being attentive but nonjudgmental in this way helps us not only to let go of negative thoughts, but to notice pleasant things that may escape our awareness because we so often rush around, either literally or in our heads. As a result of paying attention to small bursts of pleasure, happiness grows. Matter is composed of atoms and subatomic particles. Through the use of a particle accelerator it is possible to make these tiny bits collide which releases energy. Time, on the other hand, is composed of moments. And by arresting one of those moments, by concentrating fully on it, by smashing it under the intensity of your gaze, an energy will be released. Poetry, Collins says, can help you slow down and pay attention, but you don’t need to be a poet. What do you notice right now? Are you aware of something pleasant—the shape and feel of your coffee cup and the color of your coffee, the song of a bird, or the light coming in the window? The taking of breath, the beating of the heart. Gratitude for the natural world around us—the massing clouds, the white ibis by the shore. In Barcelona a poetry competition is held every year. There are three prizes: The third prize is a rose made of silver, the second prize is a golden rose, and the first prize: a rose. A real rose. The flower itself. Though we spend so much time worrying about the future or the past, it’s what’s real and present in the moment that is “the flower itself. “ To tell it another way, there’s an old Zen koan (teaching story) that illustrates these concepts. Tanzan and Ekido were once traveling together down a muddy road. A heavy rain was still falling. Coming around the bend, they met a lovely girl in a silk kimono and sash, unable to cross the intersection. The whole way back to the temple, Ekido missed the birdsong, the breeze, and the fragrance of the cherry-blossom trees—and thereby deprived himself of the pleasure around him, just so he could fume and ruminate about what someone else did. 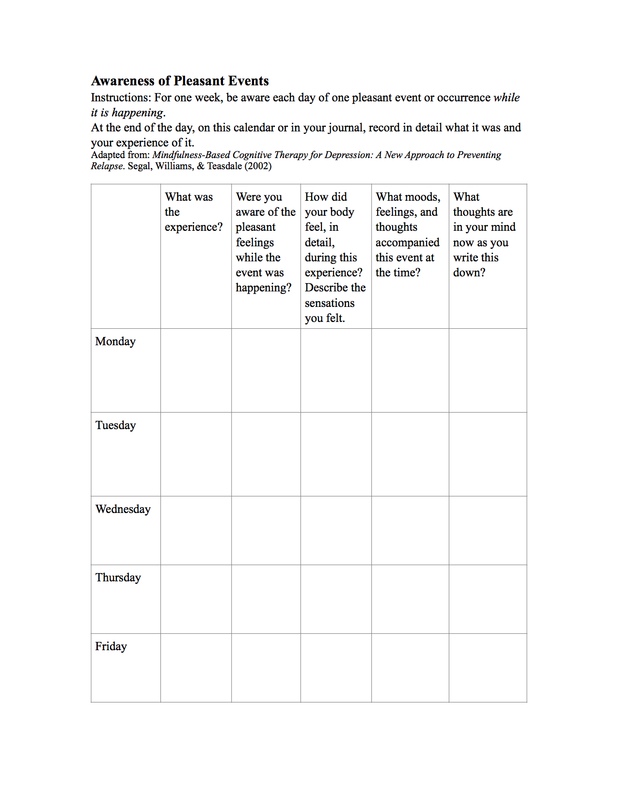 To increase mindfulness, try printing the chart below and filling it in each day. Make a point of remembering to notice just one thing each day that you find pleasant. If, like Ekido, you are still carrying unpleasant feelings, notice how far you take them, and see if you can find something in the moment that is even briefly pleasant. Is one of the best; thank you. Thanks for a thorough and helpful description of MBCT! Your explanation of what MIndfulness is and how it can be used in everyday moments is very helpful and a good reminder to start practicing! Thanks also for the chart. 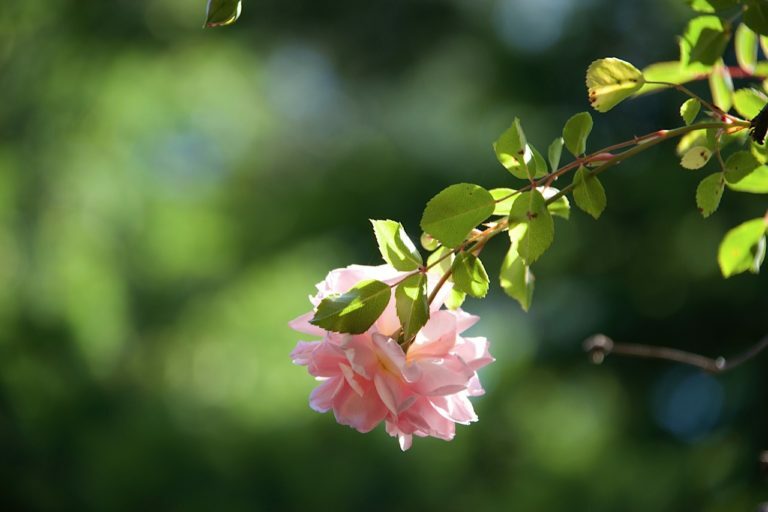 Smell and view the roses in your life! SO,RIGHT SO THOUGHT PROVOKING thank you IM going to study it a lot IM impressed tony. I’D forgotten is to meditate in the beautiful moments or feel the jubilee of it instead of focusing on the negative. thank you for bringing back feelings! Thank you! I appreciate your taking the time to write.